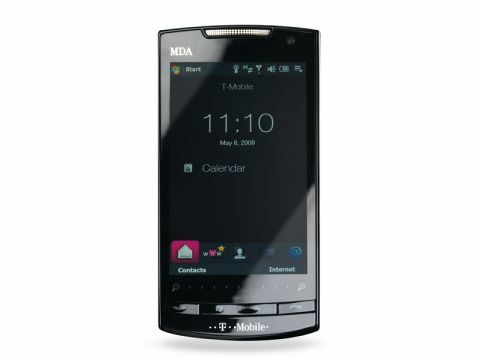 T-Mobile's MDA Compact V (free on contract) is a high-end smartphone, that crams in a high-resolution touchscreen display, a comprehensive set of features and the latest connectivity. Based on HTC's Touch Diamond2, it shares a great deal of its design with its sibling, but has a unique style and updated software. The 3.2-inch touchscreen is ideal when it comes to browsing the internet or watching movie clips, with a 480 x 800-pixel resolution producing pin-sharp image quality and vivid colours. It's easy to view, even in bright conditions, and is used for navigating the operating system and entering text. It's responsive, proving accurate when swiping a finger or tapping on internet links, although it is quickly covered in prints and grime. Although it doesn't quite match up to the best in class – mainly by virtue of the screen being smaller than some rivals – you'll find a very good onscreen keyboard. The keys aren't the largest, but it makes up for this with excellent correction software that has the ability to predict words as you type. It's not faultless, but we found it very accurate, making it easy to type at speed. Those with large hands should try before buying, however. The Windows Mobile 6.1 operating system is well disguised by HTC's TouchFLO software, with large icons that are easy to use, without having to resort to a stylus. It offers a customisable menu page – making it easy to launch your favourite applications – runs smoothly and responds quickly to actions, helped by a 528MHz processor. In-built memory – at 288MB – is limited, although you'll be able to add more via microSD cards. Quality is good, although, unlike the Touch Diamond2 it's based on, it's made out of plastics rather than metal. It's light and compact and easily small enough to slip into pockets. Although buttons are kept to a minimum, you will find call and end keys, and an easy-to-use zoom bar at the bottom of the display. There are also volume controls on the side, but a button to activate the camera is notable by it's absence. As with Samsung's i8910 HD, the Compact V excels when it comes to connectivity. 3G/HSDPA provides quick download speeds and browsing the internet is a pleasure. It's easy to navigate web pages, with the sharp resolution rendering images perfectly. GPS allows the device to be used as a sat-nav, with Google Maps also supported. Bluetooth and Wi-Fi are both built in, letting you transfer files to other digital devices and connect to wireless networks. The camera takes photographs at a resolution of 5 megapixels and, with autofocus also built in, decent images can be shot. It's slow to respond, however, and the lack of a dedicated shutter button also makes it slightly awkward to control. The MDA Compact V is a highly competent smartphone, packed with features and offering great usability. The slightly cramped keyboard won't suit all users, but it's definitely worth putting on your list.